I can hear the whoops of joy emanating around the world. Joined, of course, by mine. For years, we’ve known that a glass or two of the vino has its benefits. However, I’ve never heard of anything particularly beneficial coming as a result of drinking beer (apart from general joi de vivre, of course). 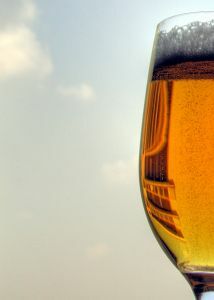 Beer, the oldest and most widely consumed alcoholic beverage on earth (according to wiki) occurs, for the most part, when malted barley is fermented. Sometimes hops (that distinctive bitter taste) or fruit is added. Sometimes the barley is replaced by wheat (my favourite), maize and rice. All of these things to be expected from a concoction to which ancient odes have been written, and with which we’ve apparently been playing since something like 9,000BC. It’s the barley, it turns out, that is particularly beneficial. Its husk contains large amounts of silicon,of all things. This silicon is present in the resulting beer orthosilicic acid (OSA). In fact, it constitutes a large proportion of the dietary silicon intake of us Western folk. And the American NIH is of the opinion that this OSA stuff may be important for the growth and development of bone and connective tissue. Happily for us, it appears that the malting process itself has little effect on the amount of OSA in the beer, as malting doesn’t really affect barley husks. Interestingly, and no one knows why, the malts which have the highest silicon are the pale ones (which have had less roasting). On the other hand, the darker malts, which have undergone more heat stress and roasting, have less silicon. And for those of you liking your beer hoppy – even better news! Hops has oodles of silicon in it – apparently, up to 4 times as much as barley, although of course hops is used in far lower quantities than barley. To paraphrase, then: for the best bone densities around, drink moderately of beers made with much of malted barley and hops. Possibly preferably pale. Sadly, for those (including me) who love their wheat beers , ales and so forth – while there’s definitely anecdotal evidence about their medicinal** qualities, they’re not quite as good silicon-wise. **Truly. Especially the Paulaner Brauhaus’ weissbier. My father and I are both willing to attest to this. First seen on the NZ Herald website, here. Wonderful research – delighted to know I now have an excuse for my beer habit!